Having taught in public schools for seven years, I know that education is a powerful cultural force and that the U.S. public school system faces some serious challenges. When we talk about problems in U.S. schools, we are usually either referring to brick and mortar or online institutions. At Master Ayub’s Park School in Pakistan, having seats, walls, trained teachers and adequate supplies is a dream unfulfilled as of yet. Pakistani firefighter Mohammed (Master) Ayub grew up in poverty himself, working and teaching his siblings after his father died. He started an impromptu outdoor school with one student when he learned that the boy he spoke to had to work during the day rather than attend school. 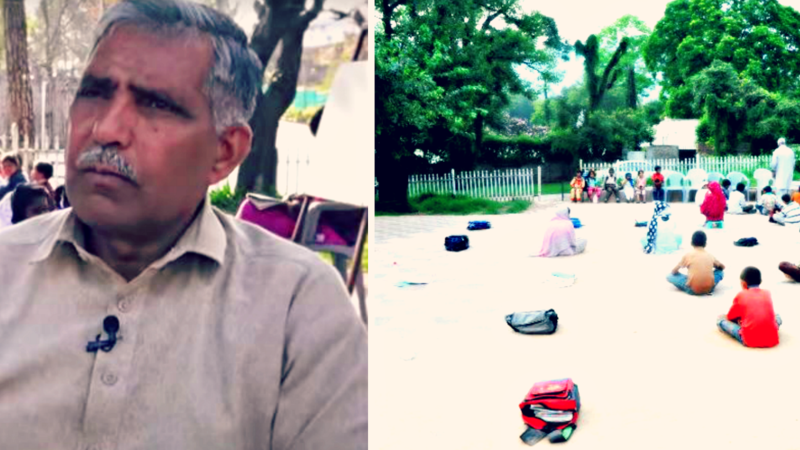 The numbers of students began to grow, and for 30 years, this outdoor school has continued to function for hundreds of Muslim and Christian boys and girls in a park in Islamabad’s F-6 sector, near Pakistan’s parliament. As the Al Jazeera video points out, Pakistan’s literacy rate is one of the lowest in the world. However, projects like this that spring up between one human being and another and grow stronger through the strength of combined human spirits, are a place to start and can remind all of us to keep caring and keep trying. Many people around the world, including myself, have reached out through social media, wanting to contact or help Master Ayub, and his school now has a campaign on Indiegogo-Generosity to raise funds to build a school. Around the world, children want to learn and need and deserve adult leadership and guidance. Master Ayub and his friends and students are heroes to me as a former teacher. They do a great job of carrying out the oft-heard advice, “Do what you can, with what you have, where you are.” They can provide us all with evidence that education, community collaboration and the spirit of kindness are internationally powerful, connecting forces that both inspire us and need our participation and support to flourish. I send my very best wishes to Master Ayub, to every child who can access his school’s offerings and to those who cannot.